The Global Volcanism Program has no activity reports for Nazko. The Global Volcanism Program has no Weekly Reports available for Nazko. The Global Volcanism Program has no Bulletin Reports available for Nazko. The Global Volcanism Program has no synonyms or subfeatures listed for Nazko. 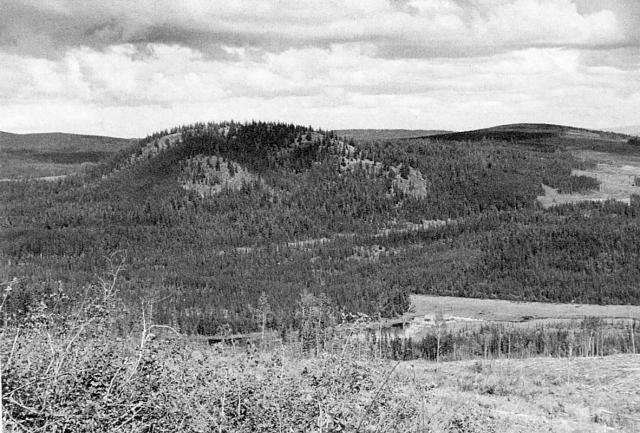 Nazko Cone, the easternmost and youngest volcano of the Anahim volcanic belt in the Chilcotin-Nechako Plateau, central British Columbia, rests on glacial till. It was formed in three episodes of activity, the first of which took place during a Pleistocene interglacial stage about 0.34 million years ago (Souther et al., 1987). The second stage produced a large hyaloclastite scoria mound erupted beneath the Cordilleran ice sheet during the late Pleistocene. The final activity occurred about 7200 years ago, forming a compound subaerial basanitic cinder cone that overtopped the hyaloclastite mound and produced two small lava flows that traveled about 1 km W. An airfall tephra blanket extends several kilometers to the north and east of the cone. Mining of the red cinder and scoria deposits began in the early 1990's. Souther J G, Clague J J, Mathewes R W, 1987. Nazko cone: a Quaternary volcano in the eastern Anahim belt. Can J Earth Sci, 24: 2477-2485. Tipper H W, 1959. Quesnel Cariboo District, British Columbia. Geol Surv Can Map, 12-1959. There is no Deformation History data available for Nazko. There is no Emissions History data available for Nazko. Nazko cone is the easternmost and youngest volcano of the Anahim volcanic belt in the Chilcotin-Nechako Plateau in central British Columbia. The cone rises about 120 m above the surface of the plateau, as seen here across a valley from the SW. The central subglacial mound is partly enveloped by younger, coalescing pyroclastic cones that form the summit ridge. The steep front of a young lava flow erupted about 7200 years ago forms the forested margin of the swamp in the middle foreground. There are no samples for Nazko in the Smithsonian's NMNH Department of Mineral Sciences Rock and Ore collection. Large Eruptions of Nazko Information about large Quaternary eruptions (VEI >= 4) is cataloged in the Large Magnitude Explosive Volcanic Eruptions (LaMEVE) database of the Volcano Global Risk Identification and Analysis Project (VOGRIPA).